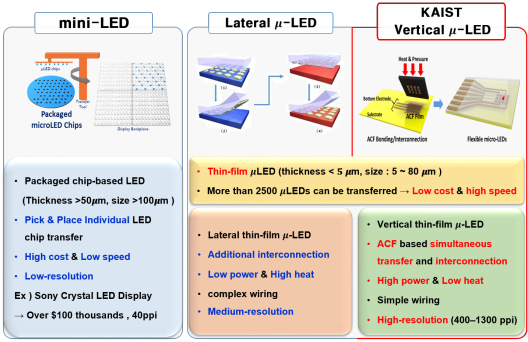 A KAIST research team led by Professor Keon Jae Lee from the Department of Materials Science and Engineering and Professor Daesoo Kim from the Department of Biological Sciences has developed flexible vertical micro LEDs (f-VLEDs) using anisotropic conductive film (ACF)-based transfer and interconnection technology. The team also succeeded in controlling animal behavior via optogenetic stimulation of the f-VLEDs. Flexible micro LEDs have become a strong candidate for the next-generation display due to their ultra-low power consumption, fast response speed, and excellent flexibility. However, the previous micro LED technology had critical issues such as poor device efficiency, low thermal reliability, and the lack of interconnection technology for high-resolution micro LED displays. The research team has designed new transfer equipment and fabricated a f-VLED array (50ⅹ50) using simultaneous transfer and interconnection through the precise alignment of ACF bonding process. These f-VLEDs (thickness: 5 ㎛, size: below 80 ㎛) achieved optical power density (30 mW/mm2) three times higher than that of lateral micro LEDs, improving thermal reliability and lifetime by reducing heat generation within the thin film LEDs. In this work, they inserted the innovative f-VLEDs into the narrow space between the skull and the brain surface and succeeded in controlling mouse behavior by illuminating motor neurons on two-dimensional cortical areas located deep below the brain surface. He recently established a startup company ( FRONICS Inc. ) based on micro LED technology and is looking for global partnerships for commercialization. This result entitled “ Optogenetic Control of Body Movements via Flexible Vertical Light-Emitting Diodes on Brain Surface ” was published in the February 2018 issue of Nano Energy.